Q: How would you describe your company’s primary business? A: Messer Cutting Systems is a global manufacturer of CNC thermal cutting machines. Our machines use plasma, oxyfuel, and laser processes to cut profiles primarily in large steel, aluminum or stainless steel plate. Our customers are processing thicker materials typically between .125” – 8”. A very typical installation would be to process multiple 8’ wide by 20’ long plates. All machines shipped in North America are engineered, designed and built in Wisconsin. Q: In brief, what is your history with the company? A: I started with Messer in 2005 as the North American Sales Manager. I am currently the Vice President of Sales and Marketing for the Americas. Our facility in the Milwaukee Wisconsin area serves as the Headquarters for North America with additional operations in Ontario, Mexico City and Sao Paolo, Brazil. Additionally, we have manufacturing headquarters in Germany, China and India. Each facility manufactures for their region but engineering is done both globally and locally. Q: How has your company changed through the years? A: As we have grown we have seen the need to be more of a global company rather than 5 unique regional companies. Being a larger global entity allows us to leverage our resources in ways smaller local companies cannot. We have focused more directly on our customer’s needs rather than our competition’s actions. This has lead us into development of new products, systems and solutions that better meet our customer’s needs. We have also turned our attention inward to make sure we are using technology and best practices in our own manufacturing and other internal operations. Q: What are interesting applications of your products? 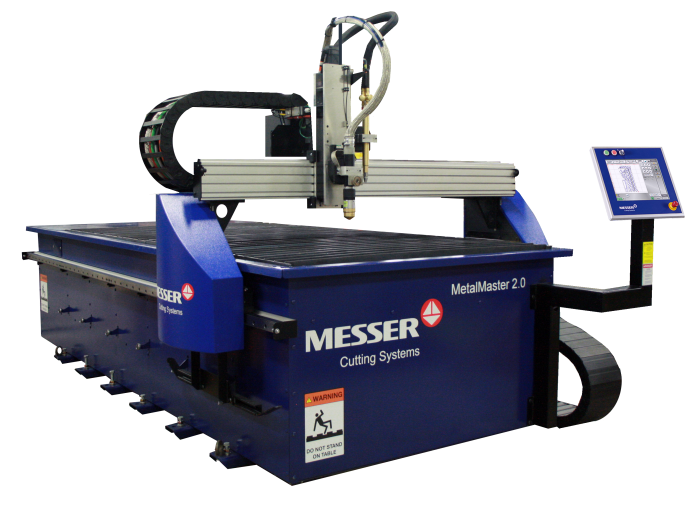 A: Our machines are designed to cut thick metal quickly and accurately to create parts that become something else. A good example is a cut plate that is later formed and welded to make a snow plow, or part of a ship’s hull, or the frame of a massive crane. Our machines can do smaller more precise cutting as well. We have a process that can countersink holes to create carriage or plow bolt holes without any tooling, which greatly increases production and significantly reduces costs. Q: What critical issues do your clients rarely know they have or might encounter?A: Surprisingly many of our clients do not accurately understand the efficiency they are getting out of our machines. We have developed software solutions to assist by gathering and reporting this information. Many clients are surprised by how little they actually run our machine. Our information helps them look at upstream and downstream processes to increase the efficiency of our machinery. It also has helped us create automation solutions which yield tremendous increases in efficiency. Q: What drives customers to purchase your products or services? A: Primarily one of three justifications is used to invest in our equipment: Customers want the ability to do this type of cutting in-house rather than outsource. Other customers have the ability but need to increase capacity. Other customers look to invest in newer technology to increase efficiency and lower operational costs. Q: In what ways can you help your customers overcome today’s manufacturing challenges? A: One of the biggest challenges all manufacturing companies face is labor. Our new machinery is designed to minimize operator involvement in lowering the labor requirement. Another major challenge all manufacturers face is to increase production efficiency and reduce overall cost and time required for production. With today’s technology, less input in time, labor, floor space, and energy now yields greater output than ever before. Q: What are you excited to bring manufacturing professionals in 2019? A: Our biggest investment in new technology is certainly the expansion of IoT and Industry 4.0 applications. Our machines are able to feed important data back to the manufacturing process. It is all about tracking and predicting. Machines can tell us when they will complete a certain task, how long it took to complete a task, identify any metrics affecting performance and even predict when something might fail or when maintenance is required. As we learn more about bottlenecks in a given production process we are able to custom fit automation solutions for most any application. We are really digging into the details and providing the owners of our machines greater value by providing more data and information than ever before.